If your kayak has been out on the water a bit, you might find yourself with scratches, cracks or even holes in the hull that you need to repair. Sure, you can always turn to your pro shop for help and most of the time you will be able to find someone to help you out with your kayak repairs. But at what cost? What if you have a big fishing tournament this weekend and you just need to get it done? If you have some basic tools and a little bit of DIY gumption, you will probably find something to help you make your own kayak repairs. We’ve outlined some repair methods that just might work for your polyethylene kayak using materials in everyday household products! Wear heavy-duty leather gloves when handling the hot plastic. For best color matching you can get repair material from your kayak manufacturer (possibly for free!) or go to repair kit websites like KayakDIY.com. You can also take small amounts of material from unseen places in the kayak like the inside of the lip around the openings, particularly under any hatches. However, you can actually find HDPE plastic in many household items like buckets, bottles and food packaging like plastic milk cartons. Check out the recycling center! When heating the plastic materials, watch carefully for the material to go from a matte to a shiny appearance to indicate readiness to work with. Be very careful not to overheat and deform the boat material. It is better to reheat as necessary than to try to do too much area at once. For welding rods and small pieces of repair material, grasp the material with a pliers (with gloves on!) or other clamp while heating with the heat gun. You can prep the surface with denatured alcohol if desired. An inexpensive plastic welding tool from Harbor Freight can be really helpful for easy bonding of the repair material to the hull. This simple method focuses on repair of deep scratches and gouges in the hull of your kayak before they become larger problems. Heat up a putty knife with a heat gun and use it to bond small pieces of tarp over the gouges. The tarp material will melt instantly upon contact with the hot putty knife and can be spread into the gouges. Use a tarp that has a similar color to your kayak. Repair is harder than the original material. If you have a small crack in the top part of the hull, you can use this simple method to restore it. Jump ahead here for info on fixing larger cracks. Carefully soften the crack area on the hull with the heat gun. Soften the patching material with the heat gun just until it becomes pliable. Spread some of the patching material over the crack with the screwdriver, making sure to bond the edges of the patch. After it dries, sand as desired and check for leaks. If you have larger cracks, particularly in the bottom of the hull, you might want to use this method. It involves reinforcement of the patch with wire mesh. After drilling small holes at the ends of the crack, use a knife or triangular scraper to make a V-groove along the crack. Gently soften the hull plastic. Heat the strip of repair material so that it starts to deform and get a bit shiny. Use the screwdriver to push it into one of the drill holes and then start twisting it as you alternately heat it and mash it into the crack with the screwdriver. Cut to size and lay a small piece of wire mesh over the crack. Heat the repair material and press the mesh into the plastic to bond, adding more material as necessary. Finish the surface by smoothing with a heated putty knife and sanding as desired. Drill small holes at each end of the crack to keep it from propagating. Using a knife or wedge tool make a V-groove along the crack to hold the repair material. Use repair rods or spare plastic from the lip edges of the openings in the top of the hull. Be careful not to get the materials too hot or they will deform and drip through the repair area. Reinforce the new repair with a fine wire mesh made of rust-proof metal such as stainless steel, like insect screen for windows. Smooth the finish with 40- or 60-grit sandpaper. If you have small holes from mounting screws or other small punctures that you would like to repair, this method is for you. Heat only the area of the hole by using a foil shield. Heat up the repair rod and insert into the hole, gently twisting to get more material into the hole. When hole is filled, use cool setting on heat gun or allow to air-cool. Sand with Dremel if desired. Use a thick piece of aluminum foil (layers) around the repair area to shield the rest of the kayak from the heat. Heat rod gently until it begins to bend. Don’t overheat as this will cause discoloration. Use Dremel with sander bit to clean up area. This method is helpful for large repairs such as large tears that are not straight. 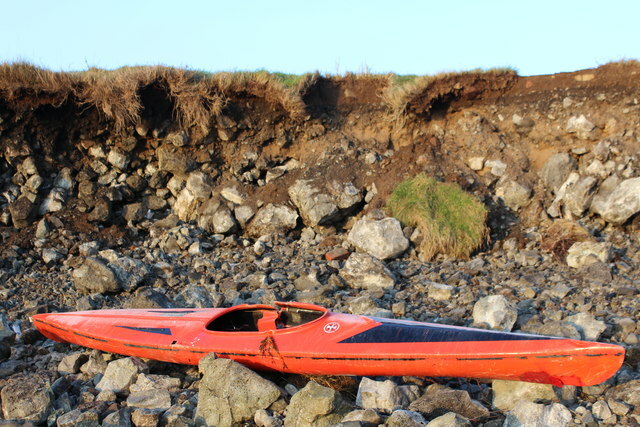 It is a bit more involved and tedious than the other methods due to the nature of the repair, but this may save your kayak from having to be scrapped! Clean the surface and sand lightly. Put some aluminum foil inside the craft to protect the far surface from the heat. Use aluminum tape to tape the torn area in place underneath the repair area. Heat the repair area and use the putty knife to fuse the edges of the tear together as much as possible. Prop something below the tear to support while making the repair. Heat the tear to shiny again and lay on a layer of wire mesh cut to size, gently pressing into the area to fuse. Use welding tool to fuse the edges. Lay on sheet of repair material, heat and gently fuse edges with welding tool. Do multiple layers of the repair material for strength. Finish by sanding and spray painting area. Use aluminum foil to shield inside areas of the craft from heat of the repair. For reinforcement, use fine wire mesh made of rust-proof metal such as stainless steel, like insect screen for windows. Use multiple layers of repair material in a repeated process. Seal edges well. Finish by heating the layers again with the heat gun and smoothing with a sponge (wear gloves) to press out any bubbles. If you have large holes in the hull, you may be able to use Method #4 with some modifications. Here’s another thought on repairing large holes. Use them to your advantage by adding your own modifications! Glass wine bottle (optional for flaring poly tubing rod holders). Large, jagged holes can be filled with rod holders made from polyethylene tubing and rough edges repaired by adding HDPE material around the poly rod holders. Polyethylene foam can be shaped to fill the hatch openings. The plastic welding tool or a soldering iron can be used to melt a groove in the side of the foam to seat into the lip of the hatch. Flare the ends of a piece of polyethylene tubing to make a rod holder by heating the tubing and shoving it onto the top of a glass wine bottle to the desired degree of flare. Search for the right color scrap of plastic among discarded bottles at the recycling center. This video shows you how. It also covers how to make hatch covers if yours are missing or damaged! Here at Aquamarine Sports, we have enjoyed putting this list together. We hope it helps you with your own DIY kayak repairs. Leave us a message below to tell us how you fixed your own kayak! This entry was posted in Uncategorized on January 20, 2017 by Diver S.